The Fire Fall AC is the fastest blade of the VICTAS Fire Fall series. The high-quality aramid-carbon fibre which is placed directly on the plywood core provides this innovative offensive blade with a larger sweet spot and fantastic attacking speed. 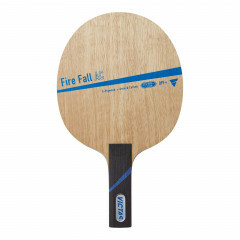 The combination of five carefully selected wooden plies with the stability and elasticity of aramid-carbon fibre make the Fire Fall AC a well-balanced blade which will inspire any modern offensive player. The direct touch enables high-precision spinny strokes, and in passive play, the VICTAS Fire Fall AC provides for consistent bouncing of the ball and low vibration. We are sure that you will love the second-to-none workmanship and noble design of this premium blade. Victas Blade Fire Fall AC is beeing added to cart.